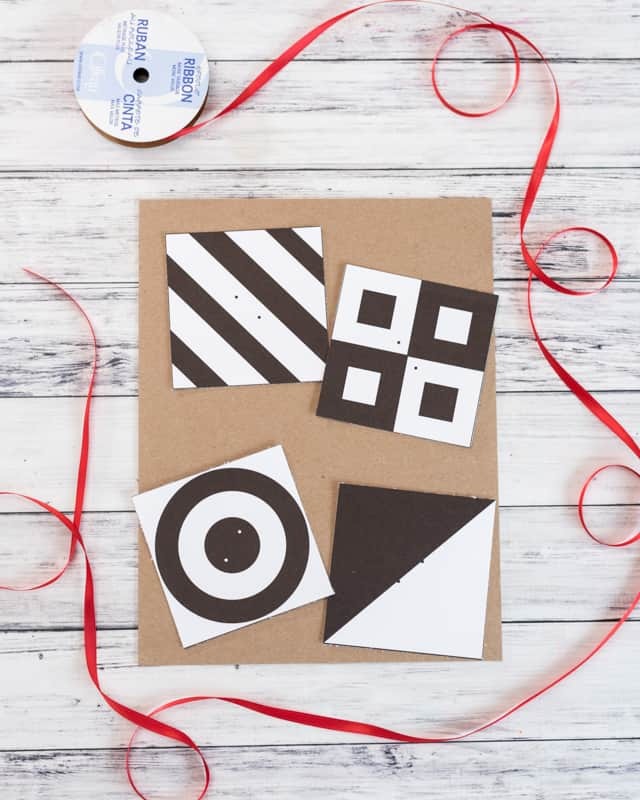 These free printable high contrast mobile cards are perfect for newborns! As regular readers know well by now, I’m a huge fan of handmade and homemade items for babies! In addition to an open-front ‘dresser’ and a baby shelf, we also made LG an activity gym. For her very first baby gym toys, I designed a set of very basic high contrast cards. She absolutely loves them! My husband and I enjoy just sitting there watching her watch the cards. 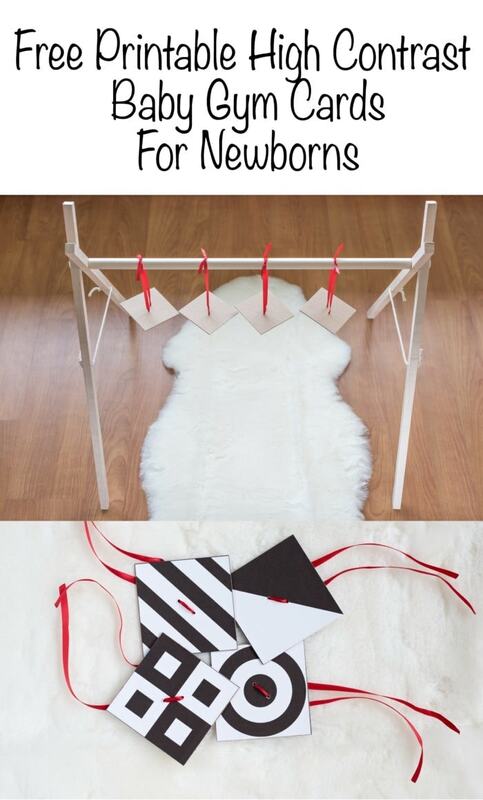 I used the cards I designed to make a DIY high contrast baby gym mobile substitute using some inexpensive satin ribbon and just a few minutes of effort. 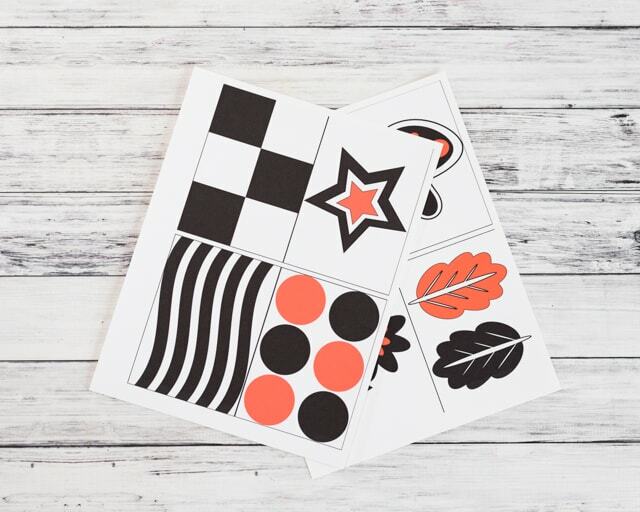 I hope you enjoy these free printable high contrast baby gym cards for newborns whether you decide to display them in a changing area, for tummy time, or hang them! People and books are always mentioning how poor a newborn’s vision is. As it turns out, newborn eyesight is estimated to usually be about 20/200. That’s actually right about what my uncorrected vision is. Womp-womp. Yes, my vision is that poor, but it was pretty handy while designing these high contrast cards! I can easily move my contact to the side and take a look to estimate whether or not LG can see something from a particular distance. Man, finally there’s an “up side” to having crummy eyesight! Standard cardstock is usually 110lb, I used this 140lb cardstock. If you live somewhere humid, like I do, consider using a piece of cardboard for backing instead of a second piece of cardstock. You can use chipboard, an upcycled cereal box, or corrugated cardboard. Scissors or paper cutter. I also used a rotary cutter since I made my backing squares out of chipboard. Awl, large needle, or something else to poke holes with. There are two versions of the printable. One version has dots marked so you can easily make holes for hanging without any guesswork. 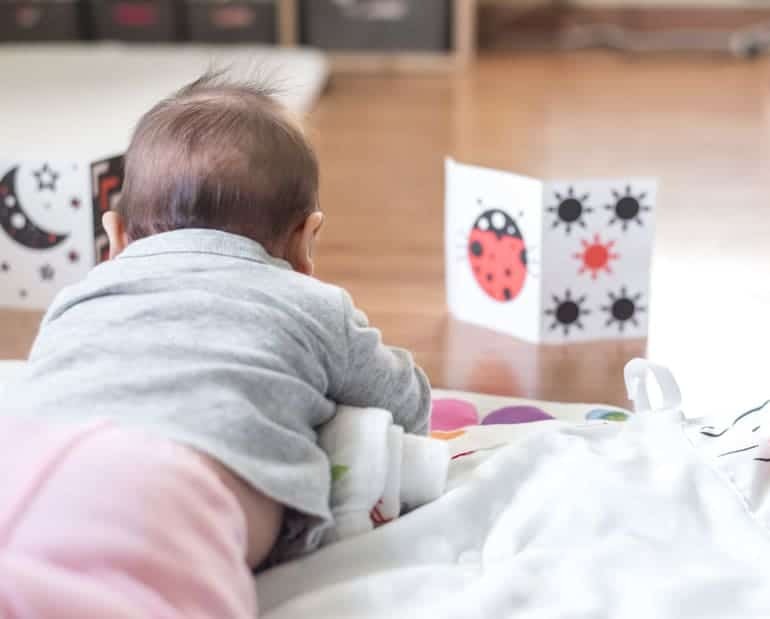 If you’d prefer to cut these out and tape them up for entertainment during tummy time, diaper changes, etc., you may want the version without the dots. Print your printable and cut each square out. 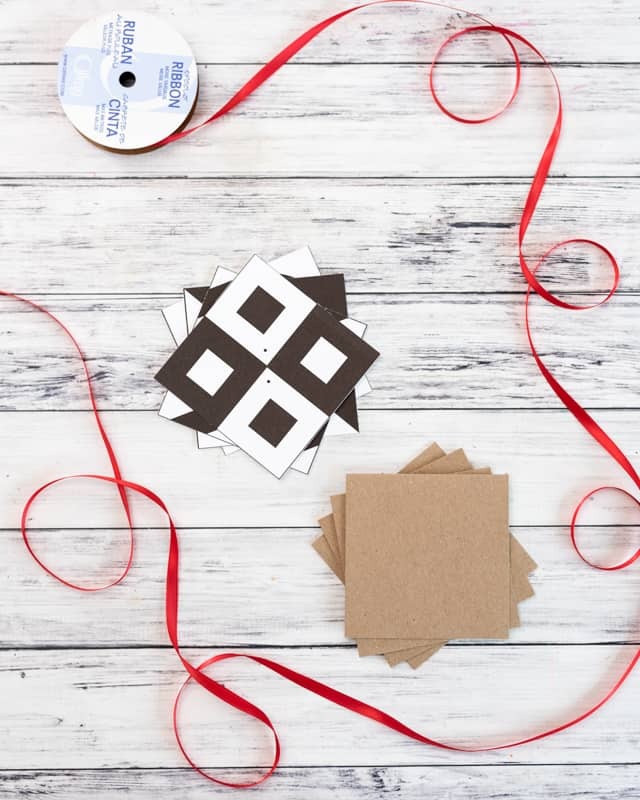 Cut out four squares of cardstock, cardboard, or chipboard that are the same size as the mobile squares. If you printed at 100%, they should be 3.75″. 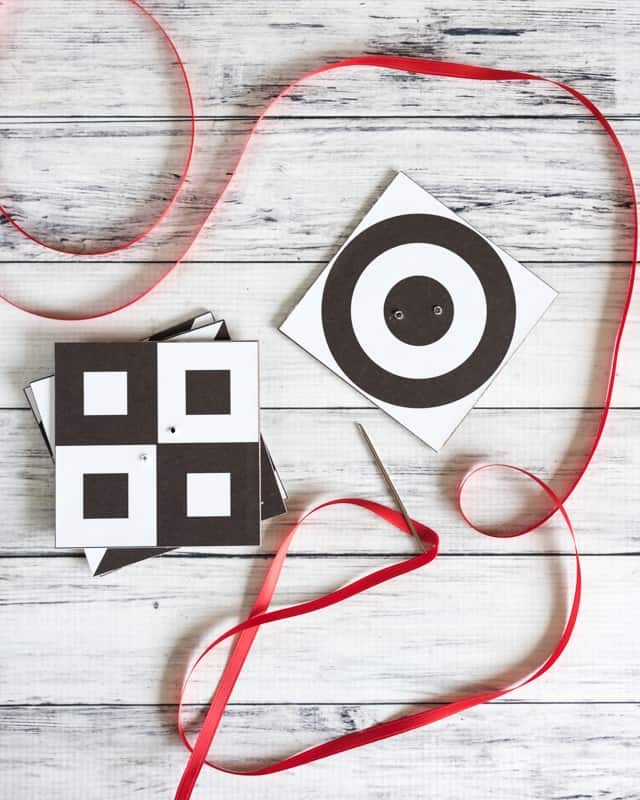 For some extra high contrast action, cut the cardboard squares larger and paint them with red craft paint to give each mobile piece a red border! Glue your mobile squares to the cardboard squares. If you’re using rubber cement and want a really strong bond, coat the back of each mobile square and one side of each cardboard square, allow the glue to dry, and then stick the two pieces together. If you’ve never tried this trick before, it’s amazing! Once the glue is dry, make holes in your mobile cards using the dots as guides. I prefer to poke the holes with an awl, but a large needle, the right size hole punch, or even a drill with a small bit can all work. 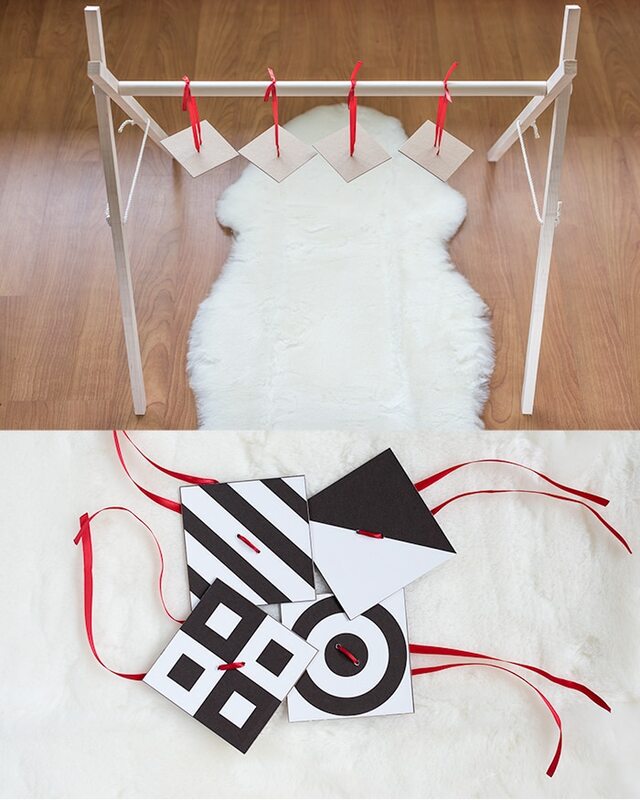 Cut pieces of ribbon, thread them through the holes, and hang! The exact amount of ribbon you’ll need depends on how far down from your play gym, activity bar, etc. you need each card to hang in order for the pieces to be an appropriate height. So when should you use these high contrast baby gym cards and what ages are they appropriate for? 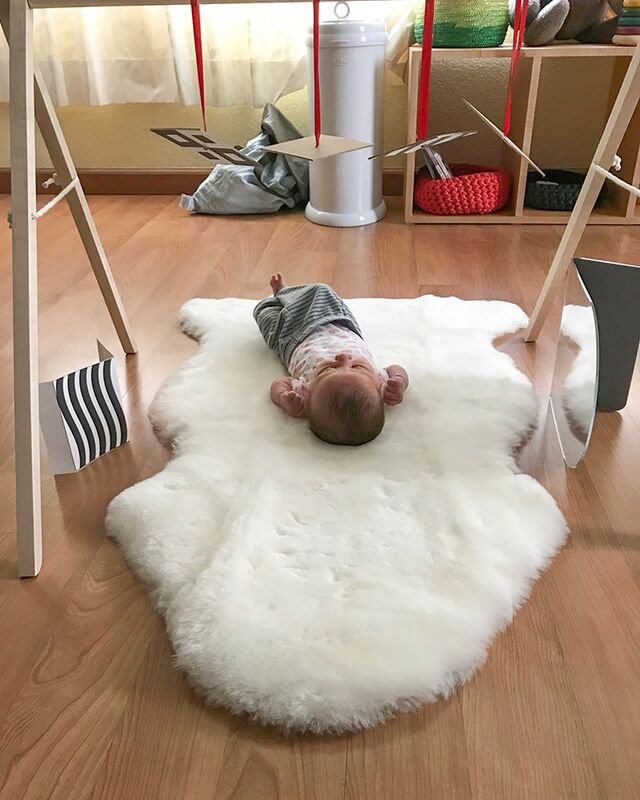 Typically in modern western society, people like to hang mobiles over places babies sleep, but the Montessori recommendation is to provide mobiles while a baby is alert and awake. 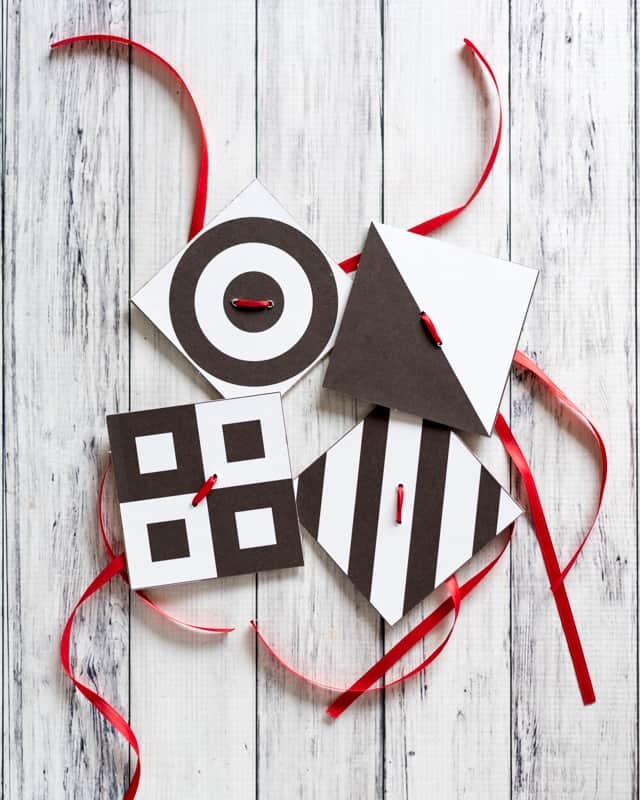 A high contrast mobile like this helps a very young baby focus and develop his/her visual sense and is intended for use up to roughly six weeks of age. I don’t even know how long we’ve spent watching our baby look at high contrast images! It’s so cool to see her really looking at them and absorbing the details. Because newborns this young typically cannot hold their head along their centerline and look straight up, if Baby’s head is turned to the side it can be helpful to position the baby off-center to the mobile. Rachel, a pediatric occupational therapist and mom of three (including a girl only about one week older than our LG! ), at Can Do Kiddo recommends always placing baby gym toys towards the sides of the gym instead of in the middle to encourage Baby to look around and help prevent developing a flat head. We’ve followed this recommendation ever since reading it and watching LG check out her high contrast cards is even more fun when she’s turning her head from side to side! Rachel’s blog is an amazing resource for developmental play ideas, tummy time, etc. and I hope you check it out if there’s a little one in your life! Because these high contrast cards are designed for very young ones, it’s best to place them about 10-12 inches above Baby’s face. And, of course, always check your ribbons to make sure they’re securely tied and never leave Baby unattended! 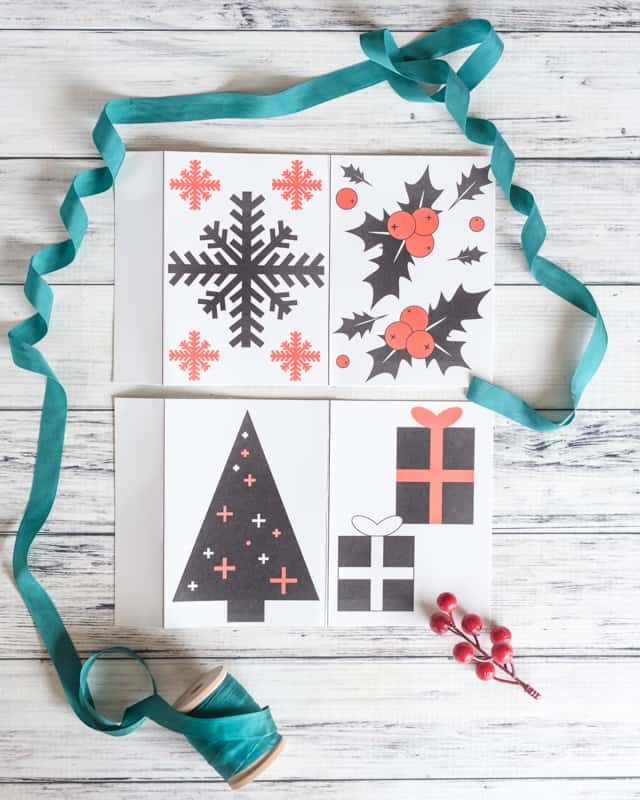 Snag more printable high contrast cards for newborns here! As your baby gets older, s/he will need slightly more complex high contrast images. 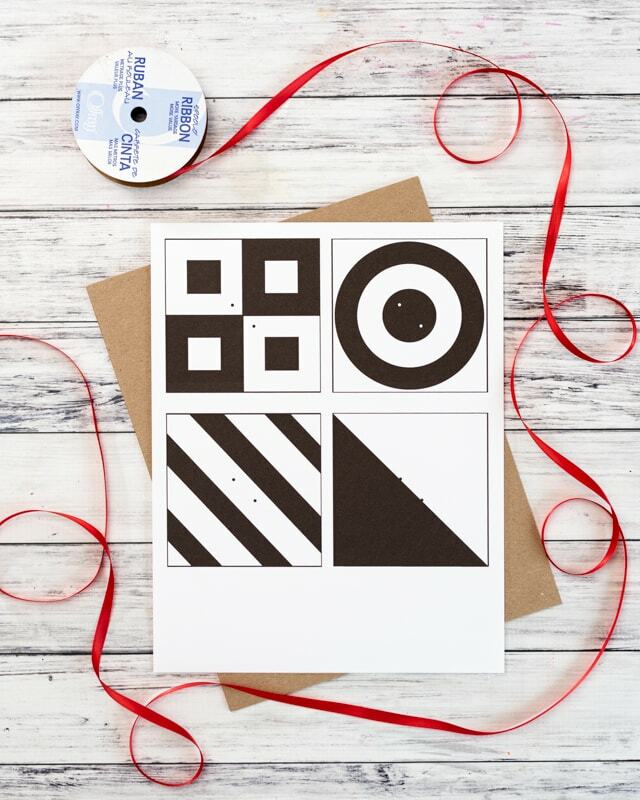 Celebrate with these high contrast Christmas cards! What are some of your favorites ways to incorporate developmental play into a newborn’s day? This is such a great idea – and so much cheaper then going out and buying a mobile of sorts! Hope motherhood is treating you well! Honestly, things are going much better than expected! A perfect mobile for precious Newborn! You definitely did your homework as Newborns love looking at Geometric shapes, since they cannot distinguish colors yet, black and white are the best visuals. The first color do see is Red. So the red ribbon is perfect. I remember when my daughter was born – the visuals I had in her crib were similar with the shapes and colors. Congratulations on your LG!! Looking forward to seeing more of your creative baby items! My parents had me make cards with large index cards and thick red + black markers for my little sister. It was a nice way to get me involved and make something useful for the baby! Our LG absolutely loves these hanging cards and some others I made for “tummy time” that I’ll be sharing soon. I’m so glad I made them for her! I definitely have many other baby projects to share in the future, I’m just trying to space them out so there are plenty of non-baby posts, too.